Since many years forgotten, amber is having a revival as jewel and fumigant – and for a short time it is also available in a liquid alchemical form: true to the recipes by Paracelsus, one succeeded to gain an essence from dissolved amber, which is regarded as a universal remedy since the Middle Ages. Still in the 19th century amber was regarded as a kind of remedy for all purposes. Nowadays its healing power is almost forgotten and solely the knowledge about the application of amber used in a necklace for babies against complaints with teething was preserved in general public. 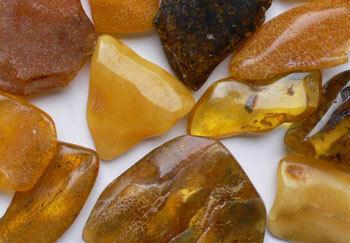 Thereby amber was highly estimated since ages as a healing stone, fumigant, and medicine. Already in the Bronze Age, around 1300 B.C., amber reached, starting from the Baltic sea coast, all parts of Europe and was very sought-after as “Gold of the North”. The sight of a particular clear amber, even one with an inclusion, is fascinating the observer still today. And its sunny, strangely melted and coagulated brilliance then warms the heart and mind and calms the emotions. The Teutons called it “Glaesum” in former times. It is derived from the old-germanic word “Glaes” and “glisis” and means to gleam from which the today’s word glass derived. For the Romans it was called succinum according to its origin, the sap of trees, called “succus”. The Greek called amber “electron” and related to its strange powers, such as today the well-known electro-magnetic qualities. Since the 13th Century it is called “Agtstein”, “aiten” in Old High German, which means something like “to burn” or “Börnstein”, derived from “börnen” (which means to “burn”) – thus it was called a “burning stone” from which nowadays the word became “Bernstein” (the meaning of amber in German). As hardly any other “gem” amber is twined with myths and is even regarded as “Tears of the Gods” – in such a way at least the myth of Phaeton describes its origin. Ovid described the myth of Phaeton in his “metamorphosis” and from other poets it was also preserved in many variations. Phaeton (engl. the “beaming”, “shining” one) is the son of the Sun-God Helios and Klymene, one of Okeanos’ daughters – i.e. a child of archetypal union of the fire and water principle. Phaeton grows up with his mother and since he is teased because of his unclear descent from children of the same age, he one day wants to prove to everybody, that the Sun-God is really his father. He persuades Helios, that he himself may drive the “sun-carriage” across the sky for one day long. As Phaeton is not able to tame the horses of the sun-carriage and the earth is already burnt for one half by the sun, Jupiter flings him with a flash away from the carriage. Phaeton falls into the river of the sky called Eridanus and drowns. At its banks his sisters mourn for him. They freeze due to grief and become trees. But their tears become amber – therefore there is the epithet “Tears of the Gods” respectively the ”Tears of the Daughters of the Sun“. The myth of Phaeton reminds of integrating harmoniously in oneself the masculine and feminine elemental forces. Otherwise sun-principle (burn up by sun-carriage and Jupiter-flash) and water-principle (drowning in Eridanus and flood of tears) mutually foam over. This equalizing principle between fiery and watery processes is found in the traditional healing application of amber again. Here it is used for stopping the blood flow and pus as well as it is used with fever; it is applied both with “overfoaming”, growing ulcers and also with hardenings and stone formations. 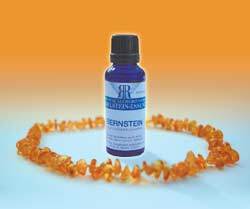 A great nurturing power in ointments and oils is attributed to amber besides. Nowadays even more familiar is its use as fumigant and as jewellery and healing stone. The easiest application of amber is to wear it as jewellery in direct contact to the skin. As a healing stone it was put on with stomach, spleen, liver, gall-bladder and kidney complaints, and with sufferings from stone diseases and nervousness. Thus for instance duke Albrecht gave white amber to Martin Luther as a medicine against his stone disease. While wearing amber, it supported moreover a “sunny nature”, strengthened flexibility and creativity and helped to keep traditional values in a positive way. When the petrified resin is used as a fumigant, its smoke shall have a purifying effect and helps mentally to digest and integrate “old subjects”. It was purposefully inhaled with stomach complaints, heart anxiety, lack of air, and having stitches. Besides amber-incenses should be able to chase away paralysis, gout and rheumatism. Already Plinius the Older (he died 79 A.D.) recommended also the intake of amber remedies with eye diseases among wearing a chain of amber against diseases of the throat, fever, and mental disorders. Dioskurides and Galen (1st century A.D.) used amber against stomach complaints, diarrhoea and flatulence; and their contemporary Rufus from Ephesos praised amber as a universal medicine. Hildegard von Bingen (1098–1178) recommends as well the intake of amber with stomach and intestine pains, aggravated urination, against black death, and mixed with wine as a kind of universal remedy. And already in the early Middle Ages amber was also used as powder for wounds, in bandages for wounds and in healing salves. Georgius Agricola (1494–1555), a well-known doctor and alchemist, the pharmacist of town in Joachimsthal and Chemnitz, already discovered in his experiments with amber the extraction of amber-acid through distillation, which centuries later should be of great importance for the production of colours. As a doctor Agricola highly appreciates amber-remedies, for it “possesses the ability to spread, and therefore, taken as a drink, stops the bleeding everywhere it appears. It inhibits vomiting, diarrhoea, pyorrhoea, which attacks the ulcers and finally catarrhs of the head and thus is effective against tonsillitis and sore throat. It also vitalizes the torso and other parts of the body.” Besides amber was good for the heart and with “heart palpitation”. “Moreover fumigant of white amber chases away epilepsy” writes Agricola. Sebastian Münster, a hebraist and humanist, well-known because of his first complete edition of the Hebrew Bible in 1534, recommends: ”In medicine one uses the ‘Augstein’ (= amber), … thus one drinks it, it stops the displeasure of the stomach, stops all flows which run into the ulcers …” Moreover it was good against stomach complaints and ulcers as well as with problems of the thyroid. Nowadays the amber essence is produced again true to laboratory-art according to Paracelsus, where far more than the three mentioned distillations are carried out in order to achieve a high degree of purification. The reason: taste and smell of amber essence, as it had been always described, is “strange” or even “unpleasant”. Even the amber essence according to Paracelsus has still a slight resinous typical taste. Since the beginning of 2005 therapists collect their first experiences with the amber essence by Paracelsus, which is again available now. According to their reports it has in fact an amazing intense, purifying and balancing effect on the entire digestive apparatus and on the respiratory tracts. The amber essence activates similar to the gold essence at once several chakras and therefore is effecting energetically in manifold ways. Especially stimulated are the solar plexus, sexual, and root chakra, which are under the control of the entire “digestion” and “incorporation”, thus the energetic integration into one’s own self as well as into the vital and sexual energies. On an energetic level it strengthens the inner harmony – particularly with disharmonies due to problems connected to sexuality and roles of the sexes and difficulties touching the polar elemental principles of male and female, of fire and water. Like this the amber essence contributes by energetic means to enable the integration of this polarity in a better way and to accept oneself. Thus it supports the overcoming of “old tears” of psychical hurts and helps to look trustful into the future. While the alchemical amber essence is at disposal since about one year, amber jewellery has a boom since 2 to 3 years, after having been almost insignificant for about 40 years. It seems as if the specific energy of amber, its effect of force from “fire and water” is especially needed of today’s time again. And thanks to the rediscovered amber essence according to Paracelsus, now one is able to get a little bit “illuminated” from inside.